St Philips Chambers saw the handover of the presidency of the Professional Institute Network West Midlands (PINWM) to incoming president, Stephen Jones. The professional group representing several institutes and organisations located in the region with 18 member bodies. It aims to develop the interests of each of its member organisations, acting as a forum and networking group providing publicity and promotion for events in the region. 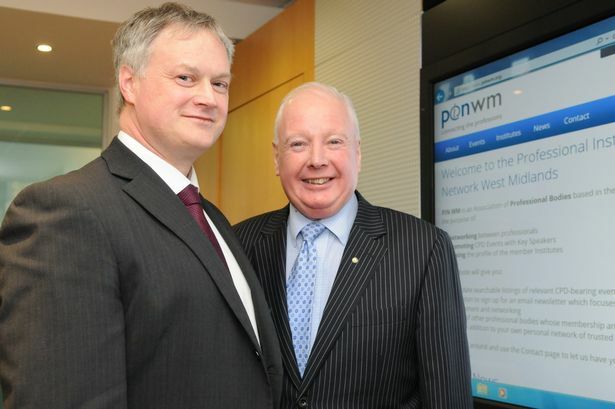 Mr Jones, a chartered financial planner and managing director of Birmingham-based Clear Solutions Wealth and Tax Management, said: “I would like to thank Bernard Shepherd for his great work in developing and extending the reach of PINWM to new professional bodies across the West Midlands, during his term as our president. “I intend to build upon that vital legacy over the next two years. My theme will be engagement and I will be looking into ways of engaging and involving all the major professional bodies and institutes.